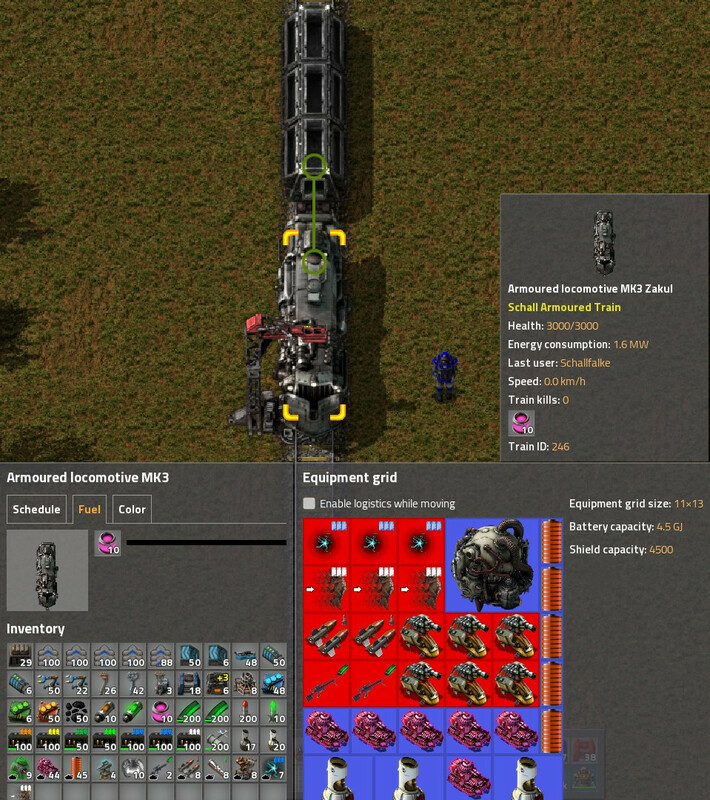 Adds sturdier (armour and vehicle grid) versions of locomotive and cargo wagon. This mod provides more defense and vehicle grids to trains. It can be seen as a continuation of Schall Tank Platoon and Schall Alien Tech mods, where the upgrades of power armors are applied to vehicles. Armoured locomotives are the same as vanilla locomotives in most aspects, except they are sturdier. These include more health, better resistances, available vehicle grid, at the cost of being much heavier and more costly to make. Because of these, they are NOT direct replacements of vanilla locomotives. Armoured locomotives are best for trains which may go deep into enemy territory, or you "exploratory" train. Vanilla locomotives are still the better in the "safe" area. Armoured cargo wagons act in the same way as vanilla cargo wagons. They are made sturdier like the armoured locomotives. However, the cargo capacity is halved (20 slots) in order to make space for various armour upgrades. Like the armoured locomotives, you may reserve this only to the frontline trains. Vanilla cargo wagons are still the better in the "safe" area. The MK1, MK2 and MK3 upgrades are similar to those in the parent mods. For more details and stats, please see the FAQ sections of Schall Tank Platoon and Schall Alien Tech mods. Armoured drasines: Like in the history, these are tanks fitted with railroad wheels. They can be used independently to patrol the railroads. Another use would be jointed together as "fast reactionary" battle train, or attached to artillery train as "guards". However, no guns are supported to locomotives or wagons currently, so this role would better be filled by armoured locomotives with defense/gun pods installed. Schall Tank Platoon is strictly required, since the vehicle grid system is provided by it. Schall Alien Tech optional but recommended. The MK3 upgrades of armoured locomotives and cargo wagons will only appear if this mod is installed. Schall Gun Pod is an extension mod, introducing several ammo-consuming turret equipment, designed to work with tanks. Still, the armoured locomotives and cargo wagons can mount some of these gun pods. Schall Overseas Railway allows construction of rails over water tiles. Nice and easy way to explore overseas! Vehicle Wagon would be an excellent addition to this mod! Attach some of these vehicle wagons to your train, and mount some tanks on them. Good for fast reaction to enemy attacks, or throwing your expeditions units to the front line!